Week five in the China Arena Football League produced a rushing performance that would have been a big day for a back in the college ranks or in the NFL. The fact that it took place in an arena football game is even more amazing. Quarterback Dak Britt of the Shenzhen Naja ran the football 25 times for 115 yards and four touchdowns as Shenzhen defeated Qingdao 47 to 10. His effort set single game records for rushing attempts, yards and touchdowns. The win by the Naja was just their second of the season and they accomplished the feat besting a team that will take part in the leagues’ championship game on November, 6. Britt, who leads the league with 13 rushing touchdowns and 374 yards, has combined with fullback Adrian Ferns to establish a single game record for team rushing yards as they totaled 154 yards. The game also featured the play of Qingdao wide out Reggie Gray who set a single game receiving yards record with 171. Gray currently leads all receivers with 597 yards on the season. He and teammate Tian Chu Zhang both had three TD receptions vs. the Naja. 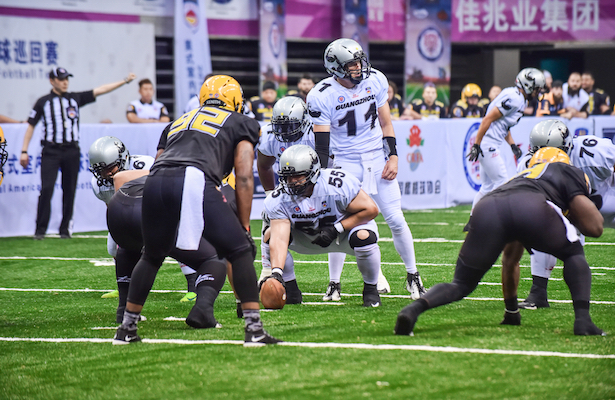 The Beijing Lions remained undefeated as they head to the China Bowl on November 6th. Beijing defeated the Guangzhou Power 55 to 32. Quarterback Luke Collis continues to be the most accurate passer in the CAFL with a completion percentage of .71.4 percent. His top target, Collin Taylor, moved up to second in receptions as he now has 38 for the season. Taylor caught nine passes for 102 yards and three scores in the Lions victory. The Lions (5-0) continue to have the most efficient defense in the league, stopping opponents’ possessions at a rate of 48 percent. Beijing leads the CAFL with 10 interceptions. This weekend defensive back Torez Jones picked off his league leading sixth interception. Guangzhou received solid play form fullback Dashawn Johnson who ran for 69 yards on nine carries with a touchdown. Johnson moved up to second place among CAFL rushers with 204 yards. It took four weeks for the CAFL to get its first “pick six.” This week the Shanghai Skywalkers pulled off that feat twice in a win over the Dalian Dragon Kings. Linebacker Zhen Nan Shao and defensive back Duane Hollis each picked off passes and returned them for touchdowns in a 63-21 win over Dalian. In that game Quarterback Shane Austin threw three TD passes to give him a league best 28 on the season. Wide receiver Mike Washington had eight receptions for 105 yards and a touchdown. He continues to lead the league with 40 receptions and 13 touchdowns. Dalian wide out Talib Wise continues to be one of the most consistent receivers in the league as he pulled in five passes for 70 yards and a score. His 36 receptions ranks him third in that department. Teammate Kent Richardson played both ways grabbing an interception on defense while pulling in eight balls for 123 yards and a score. For Richardson it was his first 100 plus receiving day in the CAFL.